For just pennies a day, you can help stop Mercedes abuse. 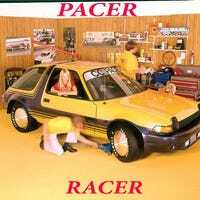 Don’t let another day go by- donate to the “PacerRacer needs a new project” fund today. This classic Chev, minus its flashy rolling stock, would look right at home in downtown Havana. I think one of the detailers here at the dealership owns it. Life is wonderful. That is all. What's LUV Got To Do With It? I had forgotten some of the benefits of living in Southeast Kansas. One such benefit is pristine minitrucks. An Unsung Hero, or a Guilty Pleasure? This Caprice is gorgeous. For those not in the know, ‘66 Chevy Caprice pillarless hardtop, done up as a lowrider. When they said this company was moving up in the world, they were right. When your compact sedan costs billions more than a Bentley, you’ve entered full on grey poupon territory. Saw this last night at Hobby Lobby and knew that Oppo would have to get a word in edgewise. The gauntlet has been thrown, Oppo- do you know any songs about Volvos? This Corolla Will Transform You Into "Ice Man"
I don’t even know what to think right now...this must be one special Corolla. Or the man behind this advert is a genius. Probably the latter. As a sequel to last weeks TDB, I decided to give you a choice between the 3 successors of last week’s cars.